Senior Living Ministries was founded in 2002 by Warren and Virginia Olson to minister to the specific needs of the growing senior community. Today, Senior Living Ministries is serving tens of thousands of seniors world-wide through its daily devo, prayer ministry, and online community. We chose the name Senior Living Ministries because so many seniors view themselves as “seniors existing or surviving.” In some cases, they even view themselves as “seniors dying.” We, however, believe this time of life can be—and should be—a time for living life to its fullest. We are Senior Living Ministries. A Board of Directors oversees Senior Living Ministries. It is comprised of Mary Kay Swanson, Bill Georgesen, Chuck Olson, Dusty Olson and Michael Risley. Michael Risley became the Executive Director of Senior Living Ministries in January, 2019. Also, he currently serves as a pastor at Voyagers Bible Church in Irvine, California, where he has served since 2002. Before that, Michael pastored at 3 other churches in Southern California. He has a bachelor’s degree from Biola University, a Master of Divinity from Talbot School of Theology, and a Doctor of Ministry from Trinity Evangelical Divinity School. Michael’s identity and mission is based upon Philippians 1:21 and states: “Living to me means simply Christ – to be all and only for Jesus Christ: To know Him, love Him and obey Him, and to help others live the same” (John 17:3; 14:21; Matt.28:19-20). Michael and his wife, Joanie, have been married since 1978. They have three adult children and four grandkids who call him, “Funpa.” He enjoys hiking, biking, gardening, wrestling grandkids, and spending time with his best friend, Joanie. Joanie Risley, Michael’s wife, is the Administrative Assistant for Senior Living Ministries. She has been a pastor’s wife for over 40 years and continues to love this role, having been blessed at each of the wonderful churches where she and Michael have been called to serve! Her current ministry is in women’s ministry leadership. 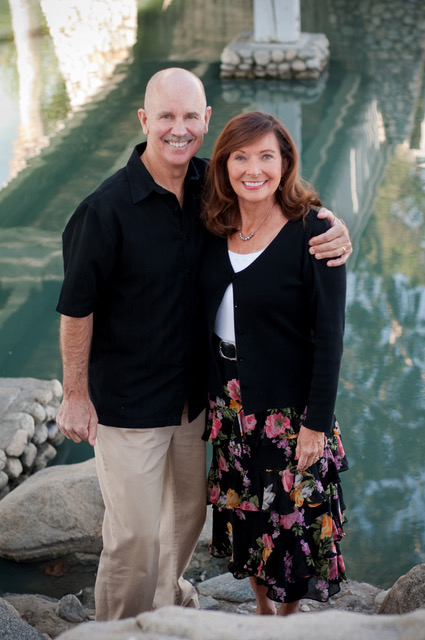 She also works as a pediatric registered nurse, having received her degree from Biola University in 1978. Joanie loves reading, exercising, and spending time with family–especially “dates” with Michael. She also adores being “Grammie” to her four grandchildren. A clear GOSPEL presentation and assurance of salvation — for peace in this life and hope for heaven in the life to come. BIBLICAL DEVOTIONALS for wisdom in godly living and encouragement of the heart. PRAYER opportunities to enact a steadfast faith in God. Teachings and opportunities for a CHRIST-CENTERED PURPOSE that gives significance and fulfillment in life. This includes The Great Commission of making disciples (Matt.28:19-20) which would involve reaching other generations for Christ. Why be involved in this ministry? The senior adult population is one of the largest demographic groups in the U.S. and it continues to grow as the large Baby Boomer generation moves into it. Seniors often go through many difficult changes that cause discouragement, confusion and feelings of being marginalized and under-appreciated. On the other hand, they can have a sense of entitlement to endless leisure that ultimately leads to lack of fulfillment and purpose in life; see King Solomon’s pursuit of pleasure and his cry, “Everything is meaningless” (Ecclesiastes 12:8). It is a demographic that has a tremendous amount of resources that are under-utilized in God’s kingdom; resources like life-experience, money, time, giftedness and even energy. There are very few ministries/churches that are effectively reaching this group of people and helping them to be all that God wants them to be. Senior Living Ministries seeks to work alongside and assist the local church in its God-given responsibility of ministering to all generations, including seniors. Seniors can have limited mobility because of health issues or other challenges; with our internet ministry, we can be a life-line to them right in their home. By God’s grace, we have seen Him use Senior Living Ministries since 2002 to help facilitate life change for Jesus in the lives of thousands of seniors all across the world. People of all ages will contact Senior Living Ministries requesting help and prayer for seniors who are in need. The requests range from the seemingly insignificant, day-to-day issues to the catastrophic. Our passion, regardless of need, is to meet those needs through the healing hope and transforming power of the Gospel. Our organizational values are to operate from a place of sensitivity, knowing that the process of getting older not only has its physical challenges, but its mental and emotional challenges… which can be far greater. When you contact Senior Living Ministries you will find, grace, compassion, empathy, commitment and readiness to serve. Senior Living Ministries is a non-denominational Christian ministry that ministers to, encourages, and challenges senior adults to embrace the fulfilled life God intends for them. Our goal is to support the spiritual vitality of Christian seniors by helping them live the dynamic, Spirit-filled life that expresses the love of Christ to family, church, and culture. We believe that the Bible is the inspired, infallible, authoritative Word of God. We believe that every human by nature is sinful and is eternally separated from God, and is, therefore, in need of salvation. We believe that Christ has paid the price for our salvation through His death and resurrection. We believe that salvation comes through faith alone in Christ as Savior, trusting that He fully paid the price for our sins on the cross. There is nothing man can do to earn salvation, but it is God’s gift of grace through faith. We believe in the resurrection of both the saved and the lost; they that are saved unto the resurrection of eternal life and they that are lost unto the resurrection of eternal separation from God.